Once again this week we take a break from discussing a particular book to examine other literary topics of interest. This week: printed books vs. the electronic version. Philip Leighton, a consultant on library design, said that “books are for reading and computers are for research.” Without going quite that far, I’ll say that if any long-suffering reader of this blog needs to be told which version I prefer, then you haven’t been paying attention. This isn’t really about which is best but what is particular to each and the joys they bring. There is of course a great deal of difference between reading the printed word and reading text (like the words you’re reading right this red-hot second). The experience of holding a tactile object in your hand, with pages that must be turned, is very different from holding an electronic device with a screen that one scrolls through and plugs in when the battery runs down. Both of them offer words but in very different ways. And let the record show, I’m heartily in favor of both. Breaking news: I love books. Real books. I love the smell and the feel of them. I have several thousand in my home, over a thousand more in my office at GHS, and several hundred in a mountain cabin. Some people see books as clutter, as something to be gotten rid of or to be periodically “pared down.” People who say things to me like, “you need to get rid of all these books” are subsequently banned from the premises, if not out of my life altogether. What utter rubbish. No, I don’t have room for them all, but if I did then I wouldn’t have enough. See how that works? Augustine Birrell put it best: “An ordinary man can surround himself with two thousand books and thence forward have at least one place in the world in which it is possible to be happy. Still, as incomprehensible as it might be to me, some people love e-readers like the Kindle precisely because it makes all those physical objects—and finding room for them—unnecessary. If you simultaneously love to read but don’t like walking into a room and seeing the majesty of rows of books displayed on a shelf (besides obviously being a candidate for psycho-analysis), then the e-reader is for you. The e-reader brings its own joys. As I’ve written elsewhere, one of the beauties of the Kindle is the ease with which one can find the complete works of some great authors and their otherwise scarce books and purchase them for practically nothing. My Kindle has the complete or collected works of the authors you’d expect to find like Arthur Conan Doyle and Charles Dickens, but also the complete works of writers whose work I’ve never come across in a bookstore, such as the masters of horror fiction like Lord Dunsany, Algernon Blackwood, Sheridan Le Fanu, and Arthur Machen; great crime masters such as Sax Rohmer (creator of Dr. Fu Manchu), Baroness Emma Orczy (The Scarlet Pimpernel), Austin Freeman (Dr. Thorndyke mysteries), Clayton Rawson (The Great Merlini series), along with the exploits of Pulp-era detectives Bulldog Drummond, Average Jones, and Craig Kennedy (“the scientific detective”); childhood favorites like Tom Corbett (Space Cadet) and the Rick Brant Adventures; timeless reads such as Lord Chesterfield’s Letters, Joseph Addison’s Spectator, as well as the complete works of nearly forgotten authors Edith Nesbit, Ambrose Bierce, H.P. Lovecraft, Thomas Love Peacock, Tobias Smollett, Ann Radcliffe, Samuel Richardson, Kenneth Grahame, Horace Walpole, and many others. It’s all at my fingertips, cost virtually nothing, and takes up no space. It goes without saying that I could never lug such a variety of genres around with me in such a compact and convenient way, even if I lived long enough to find these books in print. The e-reader is obviously perfect for the waiting room and the airport, while having the Kindle app on your phone is the perfect antidote to those interminable DMV visits or any unexpected long delay anywhere. The only drawback is that you can’t impress anyone around you by reading War and Peace on your phone. Not to mention, if you’re reading anything with that many pages—trust me on this—you’re going to need to see yourself making real progress in a real book or you’ll feel like you’re trapped in digital hell. The e-reader then is yet another wonderful tool for bringing more reading into our lives. This blog stands decidedly in favor of that. May it continue to thrive and offer readers the chance to discover or re-discover authors whose works have been sadly forgotten or those whose books grace the best-seller lists, whichever you prefer. 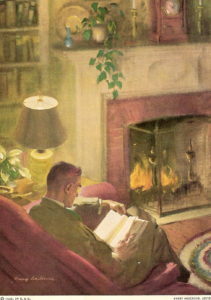 Book lovers used to despair that e-readers might one day replace the real thing. As I watch vinyl records make a strong comeback (while CDs and places to play them disappear), and the sale of e-books stagnate, I no longer worry. I’m confident that printed books aren’t going anywhere. This entry was posted in Books, Culture, Great Books, People, Science, Writers on August 12, 2018 by Stan Deaton. 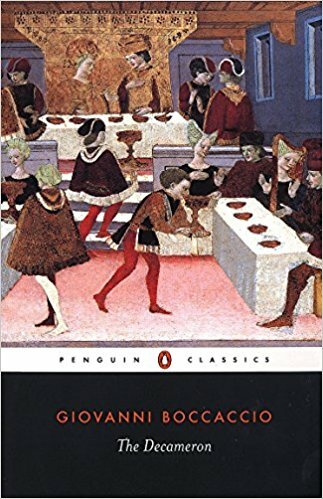 The latest entry in the “100 Greatest Books Ever Written” is Giovanni Boccaccio’s The Decameron. Written between 1349 and 1352, it’s one of the most important works in Renaissance literature. This is a big book, with enormous influence on everything that came after. Don’t be put off by the size of this book, however, or the fact that it was written over 650 years ago—it’s great fun to read. With the Black Death—the bubonic plague—rampant in Florence in 1348, ten young people (seven women and three men) flee to a country estate and settle in to wait out the scourge. To entertain themselves, and with no Wifi, they each tell a story with a different theme every day for ten days—hence the title. The Decameron is a group of tales united by a frame story, a literary device familiar to anyone who ever took a high school lit class and had to read Geoffrey Chaucer’s The Canterbury Tales, written forty years later. Chaucer’s pilgrims, like Boccaccio’s young folks, each take turns telling a story on their journey. One of the most famous examples of a frame story is The Thousand and One Nights (or The Arabian Nights), which precedes both Boccaccio and Chaucer by centuries. This collection of largely Middle Eastern and Indian stories is told by Scheherazade, married to a king who puts his wife to death each night. The heroine avoids death by telling him a different story every night and leaving her tale incomplete till the next day, thus avoiding her cruel fate. The one hundred tales that make up The Decameron are by turns funny, bawdy, tragic, heroic, and of course romantic. The work was first circulated in manuscript until the invention of printing in the 15th century with Gutenberg’s press, and the first printed edition appeared in Florence in 1469. It’s never been out of print and influenced humanist Renaissance scholars for centuries after. As with all books like this, the proper translation is everything. If you’re reading Homer’s Odyssey, try the translations by three classical scholars of towering reputation: Robert Fagles (1996), Robert Fitzgerald (1961), and Richmond Lattimore (1967), all still available and all elegantly written. Better yet, check out the newest translation by Emily Wilson, who made history in 2017 as the first woman to publish an English translation of the Odyssey after more than 60 translations by males since the first appeared in 1615. G.H. McWilliam’s translation of The Decameron in this Penguin Classics edition, first published in 1972 and updated in 1995, is perfectly pitched to entertain and delight. The tales are translated into modern English, and though he no doubt takes some liberties, the result stands as a modern classic. It’s little wonder they’ve been continuously read for six and a half centuries. This entry was posted in Books, Great Books, People, Writers on August 5, 2018 by Stan Deaton. I’d like to be able to deny this as wholly out of character for me, but alas, I cannot. At that time and for the preceding fifteen years at least—through all my years in graduate school—I read non-fiction almost exclusively, usually history or biography. It wasn’t that I looked down my nose at fiction, there were just too many non-fiction books that I felt I had to read. So many books, so little time. Five years after that—about ten years ago—I was reading one of Nicholas Basbanes’ books about book collectors and the treasures they sought, when I finally realized that my reading life and education were woefully deficient because I’d never read most of what are considered the “great books,” almost all of which, incidentally, are fiction. I had read a few in high school, but that hardly counted. That had to change. Being very deliberate about such things, I wanted to go about the task systematically, so I subscribed to the Easton Press list of the “100 Greatest Books Ever Written.” Starting with Huckleberry Finn, I began receiving a handsome, leather-bound volume—complete with moiré endpapers and silk bookmark—in the mail each month. They made a handsome new edition to my library too. Thus began a new chapter in my reading life. What might have seemed like drudgery in my teens has been one of the most enjoyable experiences imaginable. The list was of course highly subjective and carried the usual caveats, being heavily Euro- and male-centric. If I had to rank them in terms of how much I enjoyed them, I’d put Henry Fielding’s Tom Jones somewhere near the top, while some of the titles I wouldn’t have placed on any list of “great” books, if by “great” we mean outstanding works of literature or works of art. Charles Darwin’s On the Origin of Species is undoubtedly an influential book, but in my uninformed opinion it is not a great work of literature–not because of the subject but because it’s too bloody hard to read. It’s like trying to read Isaac Newton’s Principia Mathematica or Christiaan Huygens’ Treatise on Light—both are very important books, but not books you’d give to Uncle Murray for Christmas. After a decade, I have only thirteen more to go. It should go without saying that I won’t stop reading the great works of literature when I’ve read all 100. This is just the beginning. 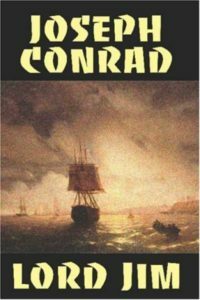 Number 88 on the list (and they are sent randomly, not ranked) is Joseph Conrad’s Lord Jim. Conrad was born in the Ukraine, and the man hailed as one of the great English novelists didn’t learn the language until he was 21. He wrote Lord Jim when he was 41. The story is a simple one, yet it goes to the heart of what it means to be human, and which we’ve explored in other books this year: What is it that creates our identity? Are we bound by the events of our past, doomed forever by the mistakes we’ve made, or can we begin life anew by force of will? Jim is the first mate on board the steamship Patna, carrying 800 pilgrims of faith to a port in the Red Sea. After the ship hits an object and begins taking on water, Jim and most of the crew abandon ship, leaving the pilgrims to face a watery grave. After the crew is picked up a few days later, they learn that the Patna didn’t sink and was instead brought safely into shore. The crew are all vilified, the captain commits suicide, and Jim spends the rest of his life trying to live down the shame of what he’s done. It defines him for the rest of his life. His misery follows him relentlessly until he lands on a remote island, where the natives call him “Tuan Jim” or Lord Jim. Does he at last find a measure of redemption before his death? Conrad in all of his work was deeply pessimistic about human nature, and though he wrote quite a few sea stores, this one is at its heart about what happens to a man with a haunted and hunted soul who is ultimately running from—and warring with—himself. This entry was posted in Books, Culture, Great Books, People, Places on July 15, 2018 by Stan Deaton.